Published: Feb. 4, 2019 at 01:40 a.m.
Los Angeles Rams linebacker Cory Littleton intercepts New England Patriots quarterback Tom Brady. 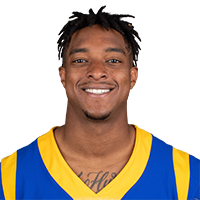 Published: Feb. 3, 2019 at 08:01 p.m.
Los Angeles Rams stop the New England Patriots on fourth-and-1. Published: Jan. 31, 2019 at 09:30 a.m.
Los Angeles Rams wide receiver Robert Woods celebrates with rapper YG after 31-yard touchdown in Week 4 of the 2018 season against the Minnesota Vikings on Thursday Night Football. Published: Jan. 30, 2019 at 01:35 p.m.
Los Angeles Rams kicker Greg Zuerlein hits a 57-yard field goal to send the Los Angeles Rams to the Super Bowl.